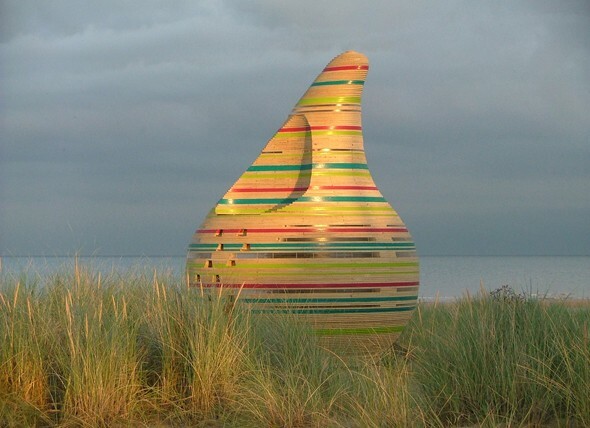 It was one of the best pieces of work I-AM has ever been part of, selected from a huge international tender by Lincolnshire County Council to create a beach hut that would play its part in reinvigorating the Eastern coastline. Enter the now iconic ‘Jabba’ (as in ‘Jabba The Hut’ for Star Wars aficionados). A design inspired by the very earliest form of seaside dwellings with an entry based on a cave and designed using layers of timber, glass and aluminium to combat the unforgiving coastal weather. Jabba became a must-see tourist attraction and even featured in the promotional build-up to the Olympics as Lincolnshire’s most iconic structure alongside local Olympian and gymnast Beth Tweedle. All good things come to an end and, after eight years, the original design finally wore-away. But Jabba has been given a second lease of life, and I-AM were delighted to contribute time to redesigning the iconic hut using solid surface material Corian to be unveiled later this month. Keep your eyes peeled for a welcome return to the shores of Maplethorpe!